This calculator solves the well-known Radar range equation for any of its variables. 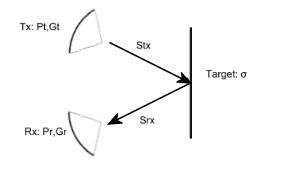 The Radar range equation relates the power received by the radar receiver to the power transmitted by the radar transmitter, the radar cross section of the target, the gains of the antennas, the frequency and the distance between the antennas and the target. The form of the equation used in this calculator allows for bi-static radar, but does not consider polarization mismatch or gain compensation for misaligned antennas.